A priest, a rabbi and an imam walk into a room… and talk scripture. Although not a joke, the opening of this sentence has an impact nevertheless for those who read it and imagine a scene with three religious leaders coming together for conversation. 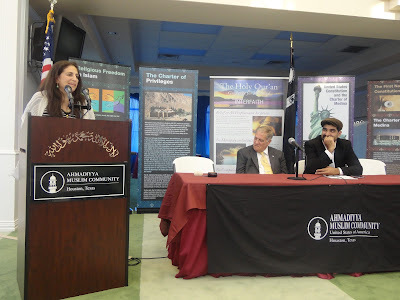 As part of my series on Interfaith Ramadan events at my mosque in Houston, TX, here is a description of a panel symposium on fasting held this week that brings home the message that practices may be different, but goals and dreams are the same no matter who we are. Our Imam invited three speakers to participate on the panel: a Jewish rabbi, a catholic priest and an expert from our own mosque community. The topic was Ramadan: Shared Traditions of Sacrifice and Worship and the goal of the symposium was to highlight the fasting traditions of the three Abrahamic faiths. The purpose: to remind us all that we are more similar than different, that if we remove the theology all religions teach pretty much the same thing. After the usual Quran recitation and welcome address, each speaker was given 5-7 minutes to explain fasting in his or her tradition. The Rabbi gave an excellent talk about the Jewish practice of fasting for 24 hours on Yom Kippur, resulting in many Muslim guests being reminded that Prophet Muhammad (peace be upon him) used to fast on Ashura (the tenth day of the Islamic month of Muharram and the day when Prophet Moses freed his people from the Pharaoh) in order to show solidarity with our Jewish cousins. The Christian speaker, a Catholic deacon, spoke about Lent and discussed the aspects of fasting according to Christianity. The Muslim speaker of course explained the basics of Ramadan and the purpose behind it. 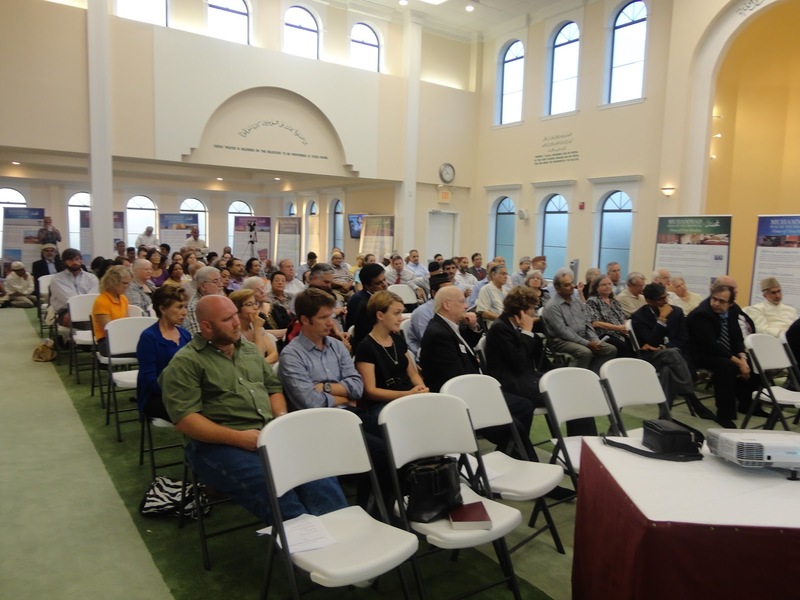 The gist of each speech and the entire symposium was the realization that Judaism, Christianity and Islam all have not only fasting in common but the aim of becoming closer to God through sacrifice, worship, devotion, prayer and charity. The symposium also included a question answer session, and brief addresses by representatives of other religious groups such as Hindu, Sikh and other Christian denominations. The Imam offered a final thank you and led the audience in silent prayers. Everyone then broke the fast, prayed and ate dinner together. While my women’s interfaith Iftaar events average 5 non-Muslim guests, by the grace of God this symposium was attended by close to 70 guests and the same number of Muslim members. Numerous guests approached me afterwards to offer congratulations and gratitude at a job well done. Needless to say the event organizers were ecstatic at such a wonderful response! For those who wanted to improve Muslim relationships with other faiths, and who wished to remove stereotypes of Islam in the community, it was a great day. For me, while those issues are important, the moral of the story was slightly different. I understood that interfaith activities that center on a common theme such as fasting have far-reaching effect beyond the immediate. When men and women of various faiths – or even no faith – meet to learn about each other, share food and drink with each other, and discuss their beliefs and practices in a non-threatening way, something wonderful happens. We see that we are all God’s children, who try to please and worship Him in our own special way. We plant the seeds of tolerance and goodwill that grow into lush greenery in the hearts and minds of not just those who attend these events but also their children and families. God be praised! Even before the animation Burqa Avenger had aired, it had already raised eyebrows and caused controversy. When I watched the first episode however, all my preconceptions melted away and I thoroughly enjoyed it. I can only imagine the positive effect it could have on young minds in Pakistan. It reminds us all of the importance of education, something we so often take for granted. I aam getting experience daily ƅʏ reading thes nice articles.